Back in May, we reported about a leaked road map for T-Mobile. One of the devices pictured was the Android powered Motorola Morrison. Now we have a spy shot of the device which really shows off the blue and white color scheme of the phone, expected to be a holiday release for the carrier. Combine the look of the handset with Motorola's past statements on creating Android devices with a focus on the social networks, and you have a messaging style phone that teens could be clamoring for under the tree in December. its funny, how engadget isgetting the credit for this. they got it from tmotoday.com. 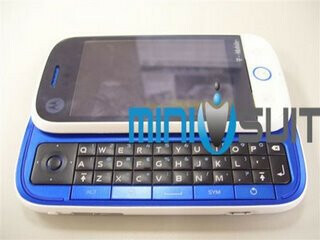 Anyway, i think this phone will be a huge hit...its going to be coming in many colors.